Color Re Transfer thermal printing of cards (PVC or Contactless). Re transfer printing is an amazing technology that allows you to print FULL COLOR, FULL BLEED IMAGES in perfect color without the drawbacks s of traditional dye sublimation card printing. 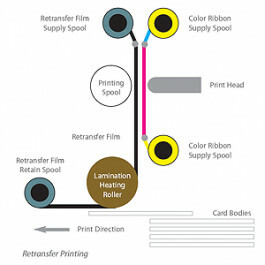 Re transfer printing is a two step printing process. First, the image is printed in reverse on to a clear panel designed to receive the image. The printer then uses pressure and heat to thermally transfer the image and the film onto the surface of the plastic card. The image resided in the card underneath a clear top coat that thermally bonds to the surface of the card.